A wonderful shot! The exposure is perfect and what a great comp considering all the dead space (the shadow, not the sea :) ) And I love this glimpse of such a legendary place. Great photo which combined with the information I have read about the fortress becomes more impressive. That's really good, fantastic view to the landscape! Really fascinating point of view and framing. I love the color contrast of blue water and warm stone. I especially like the way the window frame is illuminated around the edges. Masada must be an amazing place to see! Magical.... If I had to make a choice whether to stay inside or go out beyond that incredible frame, it would be a difficult decision. 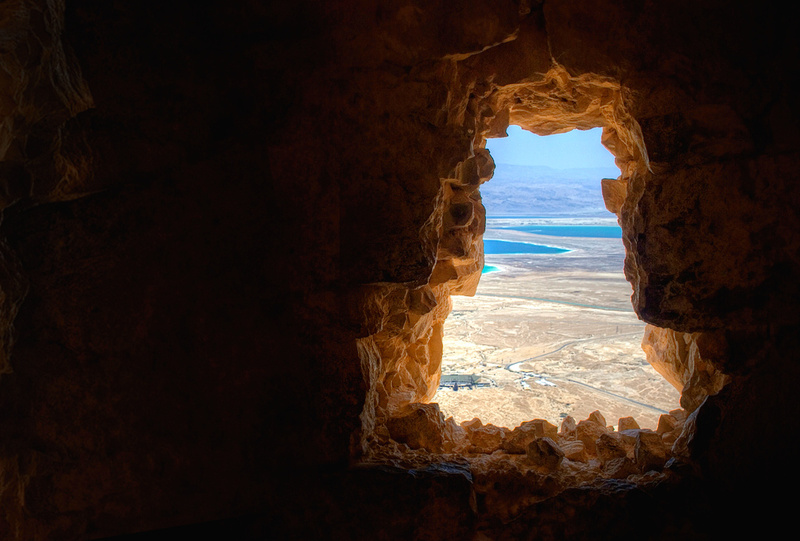 A superb image - and so symbolic of Masada's history. Wonderful composed with this contrast between the wall and the landscape. This is so nice. The most important feature of this picture is the hot colors of stones beside the cool colors of sea.